Crop Circles Research Foundation suggets the following “First-In” Research Protocol as a next step in science-based wheat or barley crop circles research. Attention Universities of Oxford and Cambridge (or other nearby colleges) Microbiology Students! Research stipend offered by Crop Circles Research Foundation! For qualified candidates this would be a challenging summer project with the potential to acquire highly meaningful scientific data about crop circles! Your schools are conveniently located near the heart of “crop circle country” in the U.K.! However, you must be in a position to respond immediately when contacted by a farmer about a newly discovered crop circle. We are offering a $1000 / crop circle research stipend for completed studies (described below) of each of 3 crop circles occurring any time over the summer in barley or in wheat. Please send your CV and 2 letters of reference from 2 of your professors, one of whom has taught you the principles and practices of microbiology. Question to be addressed: are crop circles temporarily sterilized, or nearly so, of normal crop microbiological flora? PREMISE: A study of the microbiological flora of a newly discovered yet uncontaminated crop circle has not been previously undertaken. Some evidence has shown that some not-mechanically-flattened crop circles, presuming that these exist, may be created through the controlled application of intense, directed, microwave-frequency energy, possibly configured as a “plasma vortex”1. Apical stem node expansion/lengthening observed in presumably not-mechanically-flattened crop circle plants, vs. controls. Good examples of stem apical node expulsion cavities. Plant stems are angled (“bent”) at apical nodes. Dead insects, described by some as being “welded” to seed heads. 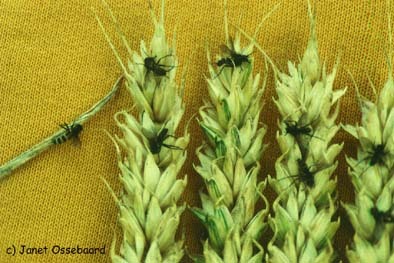 Such dead insects were allegedly not discovered on plants located outside the crop circle border. Scorched seed head from within a crop circle. Magnetic iron microspheres detected on crop and soil from within a crop circle. 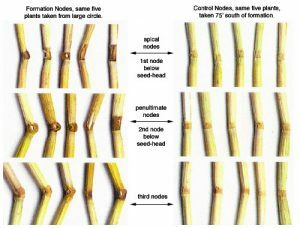 stem node “expulsion cavities”3 , plants with stems angled at stem apical nodes4 , dead insects adherent to (“welded” to) seed heads and not discovered on plants residing external to the crop circle border in the same crop field5 , residual magnetic iron microspheres (10-40 microns in diameter) discovered both on crop circle plants and on the surface of their soils6 , occasional plant seed head scorching7 , and the otherwise inexplicable crystallization of certain clay mineral deposits in crop circle soils that implies instantaneous, yet short-lived, heating of these soils to very high temperatures (600-800 degrees C)8 . Given that relatively low-power household microwave ovens have been employed to re-sterilize re-usable urinary catheters in the home9 , it seems reasonable to question if this intense, directed microwave energy postulated to be responsible for these grossly visible morphologic changes in crop circle plants and soils will also inflict more subtle-to-detect, yet lethal injury, to the normally resident surface micro-flora of plant parts located within a crop circle. Given that these micro-flora will have clearly been exposed, directly, to this microwave energy in not-mechanically-flattened crop circles, presuming that these exist, we can strongly suspect that their viability may be severely impaired. HYPOTHESIS: Plants located within the borders of presumably not-mechanically-flattened crop circles (those exhibiting some or all of the above listed characteristics), when those are created, may also be simultaneously sterilized, or nearly so, of some or even all normally-resident surface micro-flora. 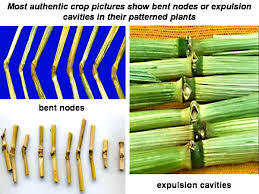 These same micro-flora will be demonstrated to be viable on (control) plants harvested from locations that are distant from that crop circle, but residing in the same crop field. IMPLICATIONS: If this hypothesis is proven correct, then the sterilization, or near sterilization, of a plant’s normally-resident surface micro-flora located within a crop circle will provide another, highly specific marker to help distinguish mechanically flattened (known man-made) vs. non-mechanically-flattened crop circles. Such a discovery would go far in helping to resolve the still ongoing “man-made vs. other” controversy, given that this effect, like the many others described above, would seem impossible to reproduce in mechanically flattened (and thus man-made) crop circles. This “First-In” Research Protocol requires that plant seed head samples, and 3 cm long stem apical node segments, be acquired (using sterile technique) by the first person to enter a newly discovered crop circle (the “First-In”), thus precluding contamination of the crop circle with biological micro-organisms that will certainly and soon be imported into the crop circle on the hands, feet, sweat, saliva, hair, clothing, etc. of crop circle tourists, as well as the same by birds, dogs, insects, varmints, rain, etc. Crop circles eligible for this study must be newly discovered and reported to an authorized team (pair) of researchers by the farmer/property owner, without delay. Any person or animal seen entering the crop circle prior to sampling will render that crop circle ineligible for inclusion in this study. Similarly, known rainfall on the newly discovered crop circle will also be regarded as a disqualifying factor. For this study to achieve meaningful results, it will be important that researchers rigidly adhere to these guidelines! To achieve this goal will require the cooperation of farmers / property owners who will be requested to strictly enforce a policy of no entry into a newly discovered crop circle in wheat or barley, even by themselves, until an approved team of researchers (2) has arrived and has acquired the necessary (crop circle and control) seed head and apical stem node segment samples, using sterile technique. Achieving this goal will likely prove to be the most challenging aspect of this project, especially during a rainy summer. Sampling and inspection procedures should require approximately 3 hours. No on-site measurements will be required and are in fact discouraged. We leave that work to others. This protocol will require a team of 2 researchers, at least one of whom is knowledgeable in the principles and practices of sterile technique (donning sterile gloves, opening sterile packaging, flame sterilization of instruments, use of an autoclave, etc.) and to techniques applied in college-level microbiology (handling sterile specimens, incubating specimens in nutrient broth, sterilizing and using a wire loop, applying samples onto agar plates, interpretation of plating results, light microscopy, slide staining techniques, etc.). Required equipment: In the field, a daypack containing adequate drinking water for 2 persons, a charged digital camera, sterile gloves (14 pair), sterile specimen cups with labels applied (16), sterile bandage scissors (14), felt marking pen (1), newspaper pages (6), masking tape. Off-site you will need access to sterile packaging, an autoclave (for re-sterilizing bandage scissors, Petri dishes, nutrient broth, etc. ), a bunsen burner, a wire loop, lots of sterile Petri dishes containing blood, MacConkey’s, and Sabouraud agars. (Consult with a microbiologist). Walk only single file in a single tram line. Wear short sleeves. From the crop circle’s peripheral border, walk single-file into the crop circle a distance of 10 steps (assistant behind sampler). Sampler: don sterile gloves, then identify a single, healthy plant located at a comfortable arms-length on a perpendicular from tram line edge by at least 1 foot (25 cm), either directly to your left or directly to your right. The plant you select must not have been touched by anything on your person excepting your gloved fingers. Firmly hold seed head while you snip (sterile scissors) the plant’s stem approximately 1 cm below the apical stem node. Assistant now opens sterile specimen container. Do not contaminate inner surface of lid. Holding upper stem or seed head, sampler secures distal end of stem between fingers 2 and 3, and then snips stem approximately 1 cm above apical node. Entire stem segment is to approximate 3 cm in length. Due to increased risk of contamination, measuring exact length is prohibited. Drop this apical node segment into specimen container. Assistant secures lid onto this specimen container and labels container as “farmer’s name, date, apical node, 10 steps”. Now, snip stem directly below seed head and discard this stem segment. Assistant opens another specimen container. Drop seed head into this sterile container. Assistant replaces container’s lid, securely. Assistant labels container with “farmer’s name, date, seed head, 10 steps”. Stay in the tram line. Sampler: walk farther into the crop circle while assistant remains stationary. Walk (estimated) halfway from assistant to approximate center of crop circle. Now, assistant moves to you and the process described above is repeated while maintaining strict sterile technique. Label 2 containers; “farmer’s name, date, apical node, halfway”, and “farmer’s name, date, seedhead, halfway”. Both now proceed, assistant directly behind sampler, staying in tram line, toward approximate center of crop circle. If crop circle exhibits a “central tuft” of standing crop, even if only a single, standing plant, stop approximately 10 feet from that “central tuft” of standing crop. Acquire your 3rd set of samples here. Label farmer’s name, date, apical node, NCT (near central tuft)”. Both walk to standing “central tuft”. Acquire 4th set of samples from this “central tuft”, securing seed head and apical node / stem segment samples in separate sterile containers carefully labeled as above but designated as “CT” (central tuft). If crop circle has no central “tuft”, both walk tram line from 20 step station to approximate center of crop circle. Repeat the process described above. Label both containers as above but designated CCC (crop circle center). Randomly acquire three additional seed heads (sterility not required) from the crop circle’s central area, place these in a specimen cup, and label container “farmer’s name, date, Fe MS (microspheres)”. Both researchers now turn around and proceed in the same tram line, back-tracking to the crop circle’s peripheral border. Walk along crop circle’s peripheral border to the next adjacent (paired) tram line. Sampler leading, walk down this tram line, away from the crop circle, and collect samples in an identical (and sterile) fashion to that described above at 10, 20, and 30 steps distant from the crop circle’s peripheral border. Place these 6 samples in separate, properly labeled, sterile containers. Label “farmer’s name, date, 10 (20) (30) steps, control #1, #2, #3 etc.”. At the 30-step control sampling station, randomly collect 3 additional seed heads and place these in container labelled “farmer’s name, date, Fe MS, control”. Now and only now, randomly collect 50 standing plants (pulled from their base) from those around you. Gently wrap these in newspaper, and securely close bundle with tape. Label bundle “farmer’s name, date, control plants”. Walk to within a 20 foot radius of crop circle’s center. Randomly collect 50 layed-down plants from within the crop circle and all within a 20 foot radius of the crop circle’s center. Bundle these in newspaper and label “farmer’s name, date, CC plants”. Do not collect any “central tuft” plants for this sample bundle. Now collect 50 standing plants (pulled from their base) from the “central tuft”, if present.. Bundle and label these as above, but indicating “CT” (central tuft). Save all bundles for later careful inspection. Now, walk the crop circle thoroughly, looking (sometimes on hands and knees) for additional evidence that might help to determine whether or not this is a mechanically-flattened crop circle. Look for angled plant stem bending at apical stem nodes (take photos), elongated apical stem nodes (take photos), stem node expulsion cavities (take photos), scorched seed heads (take photos), evidence of board marks, stem creases, stem breakage or bruising, (take photos), footprints (take photos). Please record all of these details in your properly labeled research notebook as well. NOTE: if you are able to adequately sample but a single crop circle under the very restrictive conditions and inherent obstacles that will impinge on this study, those samples acquired must be regarded as gold and processed accordingly! It is important that a microbiologist be consulted to confirm that the steps outlined below are the most reasonable materials and methods that will result in the successful acquisition of data that will address the question we seek to answer. Using sterile technique, add 20 ml of sterile nutrient broth to each of 12 (or 14, if a “central tuft” sample was collected) specimen containers, secure lid, agitate by shaking gently for 10 seconds, and then place the 12 (or 14) specimen containers in an incubator maintained at 37 degrees C (98.6 degrees F). Do not add nutrient broth to 2 containers labelled “Fe MS”. Incubate 12 (or 14) specimen containers with nutrient broth for 24 hours. (Consult a microbiologist). Using a flame-sterilized wire loop, obtain a single loop volume of nutrient broth from each labeled container, sequentially, and plate-out (streak inoculate) each specimen twice on a IDENTICALLY LABELED blood agar plate X 2, an IDENTICALLY LABELED MacConkey agar plate X 2, and an IDENTICALLY LABELED Sabouraud agar plate X 2. This will result in 12 plates per sampling station, 72 plates (or 84 plates) per crop circle investigated. After 24 hours, remove Petri dishes from incubator, remove Petri dish lids with labels showing and paired with their partner agar plate, and now take good quality photographs of what has grown on the agar plates. Make certain that labels of respective plates are visible in your photos! Good photos of this step are essential! Using a sterile wire loop, transfer a portion of what has grown on each labelled plate to 2 IDENTICALLY LABELED microscope slides. Allow slides to dry and then apply Gram’s-stain to one labeled slide, and gentian violet to the other labeled slide. Wait 5 minutes, then gently rinse the slides. (Consult a microbiologist). 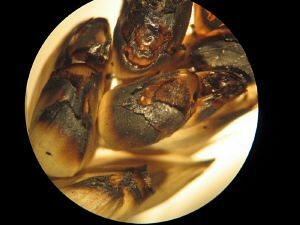 Inspect each slide under the microscope (take photos through microscope if possible) and record what you see. With 2 specimen cups containing 3 seed heads (crop circle and control) labeled as Fe MS: open “control” container first! Remove seed heads and expose each to a thoroughly cleaned neodymium bar magnet, gently passed all over the surface of the 3 “control” seed heads. 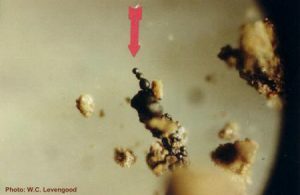 Observe ends of bar magnet under magnification while looking for the presence of multiple, 10-40 micron diameter iron microspheres which may be found adherent to the bar magnet(see photo above). Photograph these through the microscope if possible. Record in your notebook what you see. Clean bar magnet thoroughly, inspect it under the microscope to be certain that it is free of residues, and then repeat this process with 3 seed head specimens labeled “crop circle”. Photograph through the microscope if possible. Record in your notebook what you see. Open 2 (or 3) bundles of 50 plants randomly plucked from both inside and outside the crop circle, and (perhaps) from a “central tuft”. 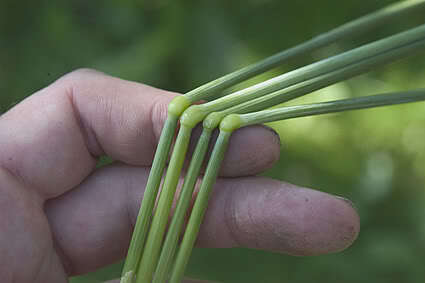 Carefully measure and record stem node lengths, in millimeters, of all 50 “crop circle” plants. Average these measurements and record. Repeat for “control” plants and record. Repeat for “central tuft” plants, if these were collected. Look for expulsion cavities (take photos) and record the number counted in each bundle, respectively. 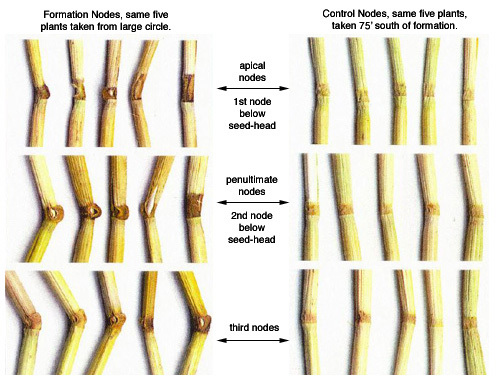 If stem bending (at nodes) is observed in plants of any bundle, record the number of plants with bent (at stem nodes) stems in each bundle, respectively. If you see marked differences in the plant nodes/stems among these bundles, note this and take good photos of what you have observed. Be assured that your participation and your serious efforts in collecting, processing, and analyzing any data acquired in this study will be immensely appreciated by Crop Circles Research Foundation, Richard O’Connor, M.D., and by many, many others! A really interesting project/experiment. Did you have any takers?